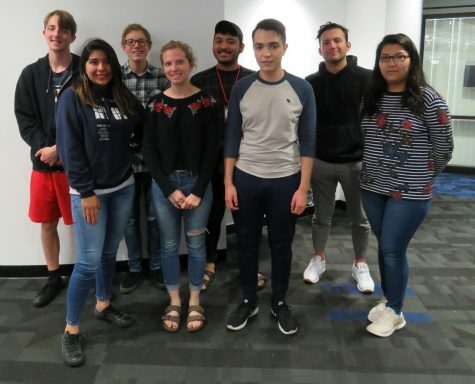 The Voice is the student newspaper of Glendale Community College and is published monthly during the fall and spring semesters. It is distributed on campus with a circulation of 1,000. The Voice is a student-run publication servicing the campuses of Glendale Community College and GCC North, in Glendale, Ariz. The site and printed newspaper are produced by students registered in JRN 215 – News Production. Stories and photos published are also submitted by freelancers. The Voice office is located on the GCC Main campus in High Tech Center 2, Room 125. Back row, left to right: Jacob Carlisle, Michael Manny, Jonathan Hernandez Morales, Jeremiah Salas. Front row, left to right: Karen Gamez, Lauren Bookwalter, Lawrence Avila, Glenda Pacheco. Letters to the editor are encouraged. Typed or legibly written letters may be submitted to The Voice by mail, or may be hand-delivered to The Voice, c/o Glendale Community College, High-Tech Center 2, Room 125, 6000 W. Olive Avenue, Glendale, Arizona 85302. Include your name (no aliases) and phone number for verification, or the letter may not be printed. The Voice reserves the right to edit letters for style, content, or length. Letters should be brief, self-edited and must be received by Monday the week before publication (The Voice comes out once a month on Fridays). Comments left on this blog are subject to staff review and approval before posting. The Voice reserves the right not to approve any comment.